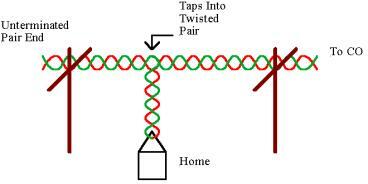 A bridged tap is an unterminated wire pair that sits in parallel to the main wire pair. Ideally, the local loop is a continuous wire point-to-point connection. At one time, the local loops were all setup this way but, with the growth of neighborhoods, new unused wire pairs got added. Typically, extra pairs are included though not initially used when cable is run down a street. When a new house is built, or a line is added, a phone company technician taps into one of the unused pairs. The technician typically does not cut the pair, the wires are just “tapped,” leaving the unterminated ends running down the street. This way, if the line is no longer needed, a technician can come out, remove the tap and still use the pair for another customer farther down the street. This leaves a bridged tap with the tap point being where the technician spliced into the wire pair on the street. Bridged taps can create an impairment to the transmission system. A signal on the loop moves down the un-terminated cable and will reflect back to the main pair affecting the main signal. A bridged tap will typically not be noticed at voice transmission frequencies because the wavelength of voice frequencies is always greater than the line length. All that is experienced is a slight increase in attenuation due to added capacitive load which is usually so small it is not detected by the human ear. However, when it comes to Digital Subscriber Line (DSL) technologies, bridged taps can cause major data communications problems and frequently require cleaning up by telecom technicians. I'll discuss how DSL technologies work in a future post. I never was completely sure why this design was adopted. Worked on loops like this for many yrs in NYC. Think it is an urban occurrence. I was once told that it was adopted to facilitate customer moves to different apartment buildings in the same neighborhood. This comports with tales my parents told of days in NYC when landlords would give 1-2 months free rent if you moved into their building. City dwellers who liked certain neighborhoods moved constantly from building to building to live rent free. Sort of like switching LD carriers in the eighties for checks and blenders.